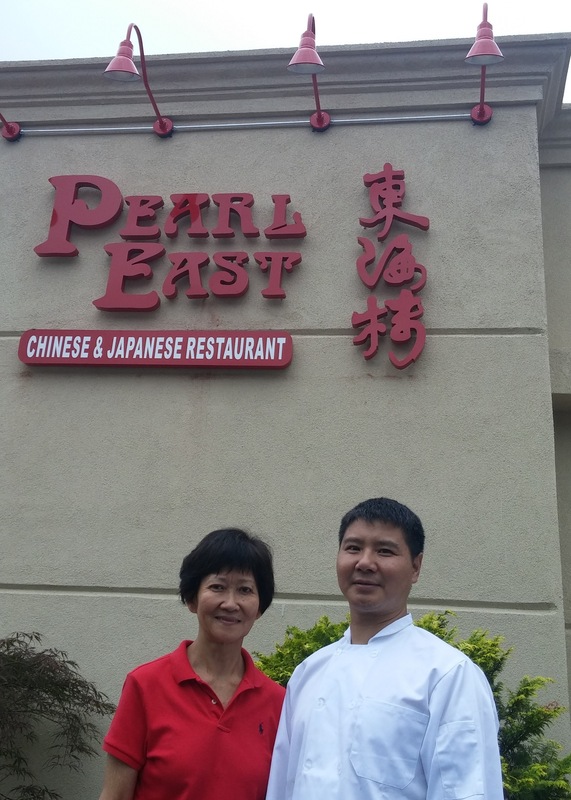 (From left) Ivy Bacher and Chef Ye will host the Grand Reopening of Pearl East on Thursday, August 13 at 5:30, 323 Hope Street, Stamford. There will be a ribbon-cutting ceremony and celebration. For details, visit http://www.pearleastct.com or call (203) 973-0072. After a fire that broke out at Pearl East on Summer Street in Stamford, owners Bee (Ivy) Bach and Chef Ye were without a restaurant. And, the people of Stamford were without one of their favorite choices for dependable Chinese and Japanese. Comments poured into their Facebook page, offering sympathy and talking about how sad they were. But, people breathed a sigh of relief when they announced that they would, indeed, reopen. Well, OmNomivores, that time is here! That’s because on August 13, Pearl East will officially reopen at their new location: 323 Hope Street in Glenbrook! The Grand Opening Party starts at 5:30 and will have a ribbon cutting at 6 that features Stamford Mayor David Martin and CT State Representative William Tong. And, while you’ll still see many of your old favorites on the menu when you stop by, you’ll also notice some new soon-to-be-favorites, too. That’s because Chef Ye (with legit kitchen experience in Hong Kong) has updated the menu with dishes like “Flounder Filet with Ginger and Scallion,” the “Duck Crepe,” and the “Sizzling BBQ” which is a combination of filet mignon, shrimp, and veggies served on a banana leaf. We have to admit, we don’t get out for Hibachi very often. Ok, very often is an understatement . . . we’ve actually only ever been once before in our entire lives, just a few years ago. Sure, it can be kitschy, but with the right group of people and a fun, talented Hibachi chef, a little kitsch can be a whole lotta fun! I mean where else can you see a knife and fire show, get food thrown at you, and have alcohol poured directly in your mouth without getting kicked out? And while you’re not going to get a fancy gourmet meal served in tiny portions on exquisite plates, you sure can get yourself some tasty, traditional Asian favorites that fill your belly for hours to come! So it was for these reasons we were excited to take Hana Tokyo up on their offer to enjoy their Hibachi experience with a couple of friends of ours. As adults, we can pick and choose what kind of food we’d like to eat. Maybe we eat healthy all week, but decide to treat ourselves once a week. Or, maybe we get a few quick take out meals because we’re just so busy. But, there are plenty of people in the world and even here in Fairfield County who don’t have much of a choice. Time after time, studies have shown that lower-income families often purchase unhealthy food because it’s cheaper, easier to access, and keeps everybody in the family fed. Unfortunately, these fatty, processed, and preservative laden foods lead to obesity and major health problems. And, nowhere is this more seen than with children who are growing, developing, and are incredibly susceptible to obesity. Lots of people have taken stands on this issue such as Michel Nischan of Wholesome Wave who fought tirelessly to let food stamps work (and work better) at farmers’ markets. Lawmakers, too, are taking steps to kill off trans fats, and make school lunches healthier too. And, there is also a group of people, restaurants, and organizations that are coming together to help out locally, too. You can be a part of this just by simply attending Fine Food for a Cause at the Palace Theatre in Downtown Stamford on 1/27 starting at 6:30. The night of music, food, awards, a live auction, and celebrity guest appearances all will be in place to help raise money for the Stamford YMCA. With the money raised they will bolster their youth development and healthy living programs and build a youth/teen wing. The center of this new extension to the YMCA will be a teaching kitchen that will be used to help teach healthy and nutritional cooking techniques and recipes to teenagers and families. Tickets for Fine Food for a Cause are $150. And there are different levels of sponsorship for individuals and businesses, too, if you’d really like to get more involved. There will be cocktails, too, so you can schmooze. Learn about honorees Madhu Mathur, MD, MPH and Tom Sanseverino. As we mentioned, there will be plenty of live music and you’ll have a shot at some amazing items that you can bid on during the live auction. The night will be hosted by Stamford resident Chris Hansen of Dateline NBC. We’ll be there and we hope to see you there, too. Even if you can’t make it, consider a donation or helping out with a sponsorship. Before we lived in Black Rock, we lived on the Saugatuck River in Westport. And, at that time, we were seriously obsessed with sushi. Not that we aren’t still in love with the good stuff, but we’ve toned it down a bit. Seriously, we were eating sushi at least twice a week. And, most of the time that we had sushi, we’d order it from Matsu Sushi in Westport. Not only is the restaurant awesome inside, but we always had great rolls and a great time there.